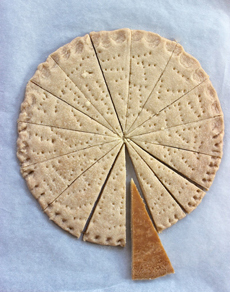 A round divided into triangles or “petticoat tails” was the original shortbread shape, baked in a round and scored. It was decorated with fork tines. Photo courtesy JulesCatering.com. This is Page 1 of a two-page article. Click on the black link below to visit Page 2. The cookies are baked at a low temperature to prevent browning. Originally, shortbread was baked in a large round, a throwback to ancient New Year’s cakes that were symbols of the sun (from the earlier days of sun worship—the edges are traditionally “notched” by pinching with the finger and thumb, thought to symbolize the sun’s rays). Today, you’ll find shortbread baked in every traditional cookie shape, including rounds, squares, hearts and fingers. Some are decorated with fork points (or, like Emily’s Cookies below, with tine prints). 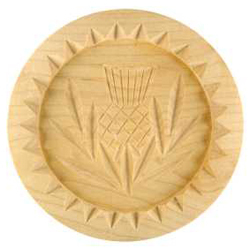 Some are pressed with fancy molds that have elaborate designs, including family crests. 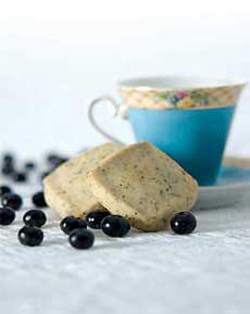 One of Biscottea’s five tea-infused shortbreads, Blueberry Shortbread with Organic White Tea. Over time, Scottish shortbread recipes were variously flavored with almonds, chocolate chips, cinnamon, ginger, lemon, orange and vanilla. Scotland has its regional shortbread variations as well. In the Shetland Islands and Orkney Islands, for example, caraway seeds are added to the recipe, and the cookie is called “Bride’s Bonn.” At Christmas, a variation is made with citrus peel and almonds. Modern bakers have brought the recipe into the 21st century. For example, Emily Kiechel of Emily’s Cookies in Brooklyn, New York bakes shortbread in Black Pepper & Maize, Espresso Chocolate, Ginger Cacao, Green Tea, Spicy Chocolate and Vanilla Sea Salt. How good are they? 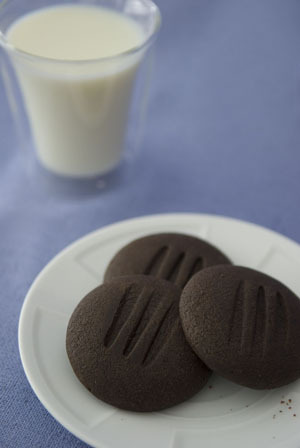 Oh...they’re the best cookies we’ve had this year, and a NIBBLE Top Pick Of The Week. Biscottea, another Top Pick Of The Week, makes a shortbread line infused with five different types of tea: African Honeybush Tea Shortbread, Blueberry Shortbread with Organic White Tea, Chai Shortbread with Organic Chai Spices, Earl Grey Shortbread with Darjeeling Tea and Mint Tea with Organic Peppermint & Spearmint Leaves. And, if that’s not enough in the cornucopia, their Biscoffee line features Cappuccino Coffee Shortbread, Espresso Coffee Shortbread and Mocha Coffee Shortbread. Chocolate espresso shortbread from Emily’s Cookies. Photo by Corey Lugg | THE NIBBLE. As long as there are gifted bakers, there will be exciting evolutions in shortbread.